Adding external resources to a project's include path makes resources outside the project available for operations such as debugging and content assist. See PHP Include Paths for more information. This procedure describes how to configure your project's Include Path. -Or- right-click the project and select Properties | Include Path. The project's PHP Include Path properties page will appear. By default, all folders which are on your Include Path will be added to your Build Path. If your project root is on your Include Path, all folders and resources contained within your project will also be on the Include Path. To add only certain folders, remove the project root from the Include Path and add only the required folders. To remove a folder, select it and click Remove. To add a folder from your project, click the Add Folder button and select the required folder. A prompt will display, asking whether you would also like to add the selected folder(s) to your Build Path. It is recommended that the resources on your Build Path match the resources on your Include Path. Click Yes to add the folder(s) to your Build Path or No for your Build Path to not be affected. The Required Project Selection dialog appears. Select the projects you would like to add and click OK. 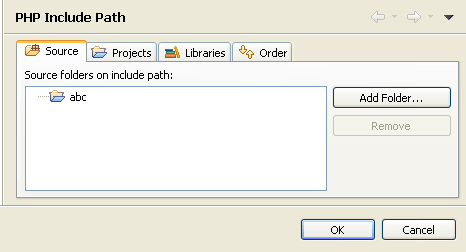 The selected project(s) will be added to your project's Include Path. The Add Library dialog appears. Select the required Library (if available) and click OK. The Add Include Path dialog appears. Browse to and select the required folder. The folder will be added to your project's Include Path. The library is a read-only file and will not be available for editing. Select the "Order tab". This determines the order in which resources will be searched for in require/include calls. See Include Paths for more information on the order for which files are searched for. If applicable, it is recommended that elements appear in the same order as they do in your php.ini. If necessary, rearrange the order of the entries. To do so, select an element and click Up or Down to move it in the list. Once all the elements are added and are in the right order, click OK.
All the selected elements will be added to the project's include path.